Authorities have confirmed that four people have been arrested in relation to the protests on Michigan Avenue on Black Friday. Two of the arrests are traffic related, and two are battery related, though the identities of those arrested and their formal charges have not been released. 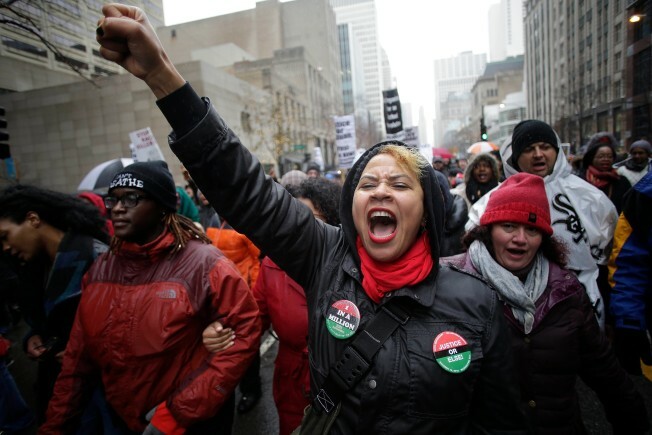 The arrests were made as hundreds of protesters descended on Michigan Avenue on Black Friday, marching up the major shopping strip in Chicago in response to the release of the dash-cam video showing the fatal shooting of Laquan McDonald by a Chicago police officer. The demonstration, organized by Rev. Jesse Jackson and several community activists and church leaders, began at 11 a.m. Friday. It started at Michigan and Wacker and proceeded to Water Tower Place, where some protesters attempted to block store entrances at Neiman Marcus, Tiffany & Co., Victoria's Secret and Macy's. Carrying signs that read "Stop police terror" and chanting "Rahm Emanuel has to go" and "Garry McCarthy must step down," protesters blocked traffic on both sides of the Mag Mile. At one point, protesters attempted to get into Macy's on Water Tower Place, as well as H&M and Columbia on Michigan Avenue, saying if they weren't allowed in, no one would be able to get out. The demonstration, organized by Rev. Jesse Jackson and several community activists and church leaders, began at 11 a.m. Friday. It started at Michigan and Wacker and proceeded to Water Tower Place, where some protesters attempted to block store entrances at Neiman Marcus, Victoria's Secret and Macy's. Traffic was blocked for four hours. Protesters continued to block the entrances of some stores, and at around 4:30 p.m. a fight was reported outside Banana Republic. Earlier this week, protesters took to downtown city streets, resulting in several arrests. A group of protesters were also seen tearing the lights from the Christmas trees standing in Millennium Park. Footage from the dash-cam video was released more than a year after the October 2014 shooting. Several officials, including Mayor Rahm Emanuel, Chicago Police Supt. Garry McCarthy and Cook County State's Attorney Anita Alvarez, faced harsh criticism for the timing of the video's release, and some residents and activists called for the resignation of all three of them this week.